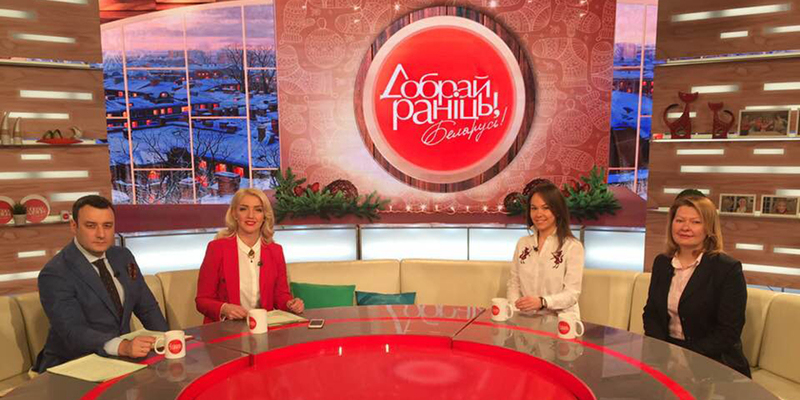 Important discussions on the important - ООО "Актив Лайф Технолоджи"
On 6th of December Anna Akulich, a brand-manager of our Company, and the emergency physician Olga Svetlitskaya discussed an important issue many people care about – blood-stroke and heart-attack prevention – within the live television program Good morning, Belarus! on the Belarus-1 TV channel. Nowadays, accurate blood pressure measuring is discussed, by medical experts and mass media, as a preventive measure to reduce the number of deaths caused by blood-stroke and heart-attack. Olga Svetlitskaya put it in details who form the risk-group and what everyone can do to reduce the risk of being affected by those diseases. Anna Akulich emphasized the importance of prevention popularization, the correct understanding of the blood pressure measurement algorism as well as told about the AFIB technology which facilitates blood-stroke prevention. The average daily viewership of the program amounts to 600,000. If, at least, 1 in 2 program’s viewer starts changing his or her life following the rules of healthy and balanced diet, active lifestyle, rejection of smoking and alcohol drinking, stress minimization and arterial pressure monitoring, the number of deaths caused by blood-stroke will drop. Start caring about your health and yourself right now!